My favorite piece of office "equipment" is a pair of crocheted fingerless mitts. The office here at Interweave is a gorgeous bank building, circa 1928. It is inspiring to work in, but some of the offices can be a bit chilly. So a collection of crochet fingerless gloves and mittens is the best solution for keeping your fingers in top shape as you type. There is a wonderful selection of free crochet patterns on Crochet Me. Check out some of these beautiful patterns designed by Crochet Me members. Worked entirely in back loop single crochet, these mitts are perfect for a beginning crocheter. The back loop only design also gives them wonderful stretch. Julia created theses mitts as a last minute crochet gift. 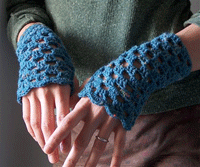 I know several people who would love these fingerless mitts. Go to the crochet pattern. . . These fingerless gloves have tons of great texture. The ribbing around the wrist ensures that, despite the lacy look, these crochet fingerless gloves will keep your hands plenty warm. If you need a tutorial on creating the bullion stitch, check out this week's "How to Crochet the Bullion Stitch" blog. Go to the crochet pattern. . . If you are looking for a pretty fingerless mitt pattern for days with just a touch of chill, I love this openwork design. The pattern is quick and easy, perfect for a quick crochet gift or a beginning crocheter. Whip up several pairs and keep them on hand for unexpected gift needs. Go to the crochet pattern. . . Perfect to pair with a t-shirt for added warmth or to keep you toasty on a cold winter day, these fun striped fingerless mitts are fantastic. Try whipping up a pair in your school colors or favorite sport team's colors. Go to the crochet pattern. . . 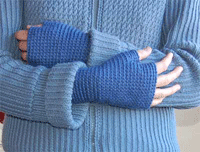 Try a pair of fingerless mitts today and stay warm this winter.